Verizon XOOM owners, the time has come. If you still care about upgrading your device so that it has 4G LTE capabilities, then tomorrow you will want to visit this site. As far as the rest of this press release goes, I’m assuming that those of you that bought this back in February are not going to be all that thrilled. 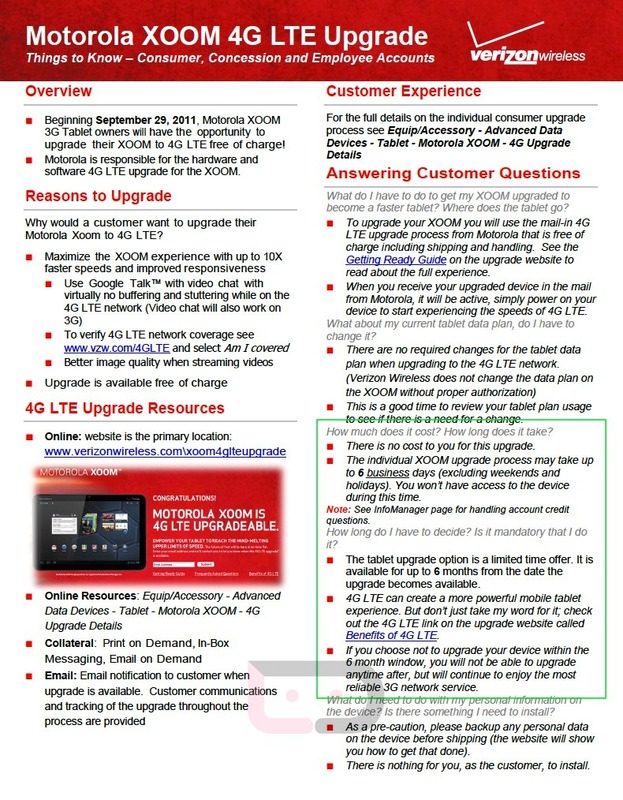 You get upgraded for “free” yet you paid $100 more on-contract ($230 more at full retail) than those that will wait to pick one up on October 13 – the day the pre-installed LTE version launches. Couldn’t toss in 3 months of free service or something Big Red? Maybe $100 credit to XOOM owners’ accounts for putting up with 2 delays and months of waiting? Remember, this upgrade was supposed to happen back in May…we are almost into October. Just sayin’. Download the “Getting Ready” guide here. More details after the break. Upgrade will take 6 business days. Owners have 6 months to send their device in for the upgrade. BASKING RIDGE, N.J. – Verizon Wireless and Motorola Mobility, Inc. (NYSE: MMI), today announced the Motorola XOOM 4G LTE upgrade will be available for existing Motorola XOOM customers beginning tomorrow. The Motorola XOOM 4G LTE will be available in Verizon Wireless Communications Stores and online at www.verizonwireless.com beginning Oct. 13 for $499.99 with a new two-year contract. Starting tomorrow, Motorola XOOM customers can visit www.verizonwireless.com/Xoom4GLTEupgrade for complete instructions and to begin the 4G LTE upgrade process. Customers who signed up for email alerts will receive an email notification with instructions tomorrow. Customers should expect to get their updated Motorola XOOM with 4G LTE back in approximately six business days. The 4G LTE upgrade is free of charge and customers do not have to change their current data plan when upgrading to 4G LTE. Customers are encouraged to back up any personal information prior to shipping. Faster speeds and connections enhance the Motorola XOOM experience, allowing customers to download songs in seconds and movies in minutes. Customers should expect average download speeds of 5 to 12 Mbps and upload speeds of 2 to 5 Mbps in 4G LTE mobile broadband coverage areas. 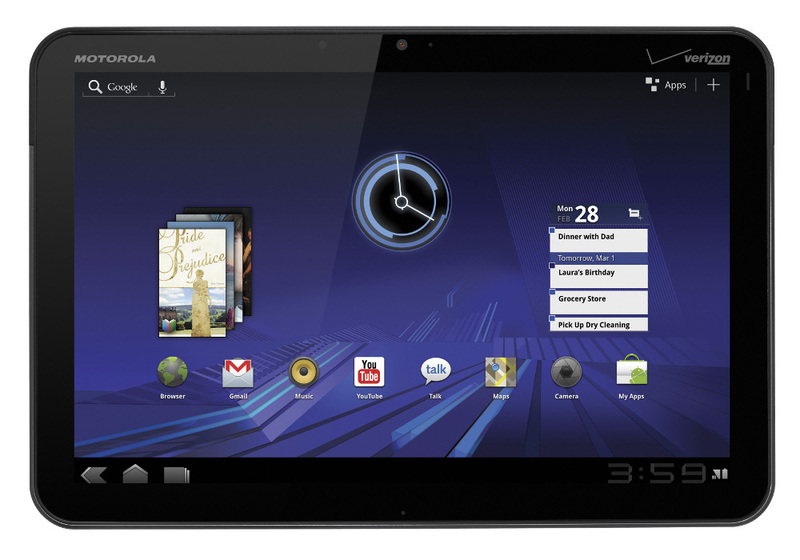 When customers travel outside of a 4G LTE coverage area, the Motorola XOOM automatically connects to the Verizon Wireless 3G network, enabling customers to stay connected from coast to coast. · Wi-Fi networks are generally short ranged and provide wireless Internet access to localized public areas (often called hotspots) such as airports, hotels, and coffee shops. For additional information on Verizon Wireless products and services, visit a Verizon Wireless Communications Store, call 1-800-2 JOIN IN or go to www.verizonwireless.com. Visit www.verizonwireless.com/4GLTE for more information about Verizon Wireless’ 4G LTE network. Android Market, Android, Google, Gmail, Google Calendar are trademarks of Google Inc.